How Much Does Mobile Shredding Cost? Shredding documents past their required retention period is a must. Keeping private information safe will not only protect your organization’s reputation, it will also keep you in compliance with the law. If you don’t have the time to gather and transport boxes full of paperwork to be shredded, the solution is easier than you think. A mobile shredding truck will come right to your doorstep and take care of the documents for you. Onsite shredding is incredibly convenient—and it’s also fairly affordable. The cost of shredding onsite can vary by region, but on average it costs $100 to send a mobile shredding truck to perform the shredding at your location. How Many Pounds of Paper Do I Have that Need Shredding? For more help estimating how much paper you have, use our shredding calculator tool. What Are the Advantages of Mobile Shredding? Mobile shredding is not only one of the most convenient and affordable ways to shred, it also saves time, provides security, and creates a paper trail with a certificate of destruction. Gathering and transporting documents to an offsite shredder takes time. With mobile shredding the truck comes to you and collects all your documents and carries them out to the truck for you. This helps save time, and when you pre-schedule your shredding services you hardly have to think about the process at all. With other shredding services, you are not able to see your documents being shredded firsthand. Mobile shredding is done on-site so that you can witness the destruction of your documents right in front of your eyes, giving you an even greater sense of security. 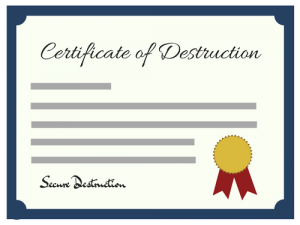 The mobile shredding contractor provides you with a certificate of destruction to legally document the proper disposal of your confidential documents. This describes the details of your service, including where and when the destruction took place. This protects your business in case of an audit or other legal troubles. Get Free, No-Hassle Quotes on Mobile Paper Shredding Today! Shred Nations specializes in helping you find the mobile shredding contractor that’s right for your business, regardless of the size of the job. For a FREE quote on secure services from a mobile shredder near you, fill out the form to the right, or give us a call at (800) 747-3365. Within minutes of receiving your request, you will receive quotes from local mobile shredding contractors so that you can select the service option that fits your project best.